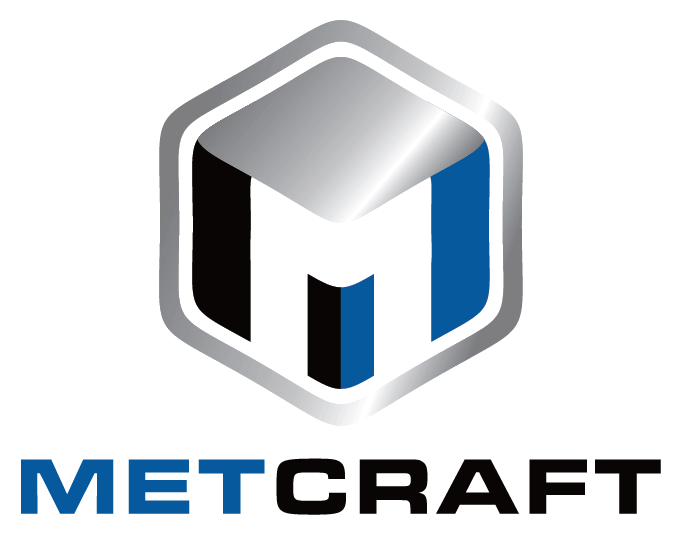 Metcraft offer a range of fuel polishers & conditions. 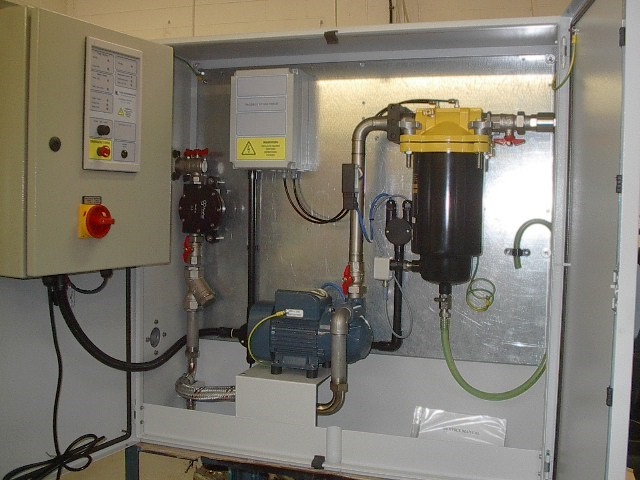 The Metcraft Fuel polisher and conditioner with a magnetic ion alignment chamber a single pump and a filter/water separator is a bespoke unit built to specification. 10 micron fuel filter complete with drain valve and hose. Filter ‘service’ warning via DP (differential pressure) switch and water sensor. 50 litres / minute flow rate using self-priming pump. Flow failure warning via flow switch. Diesel fuel polisher ‘Smart’ control unit giving multi functions, indicators, user friendly 7 day timer and two BMS outputs. The Control Panel is delivered ready wired and plumbed. 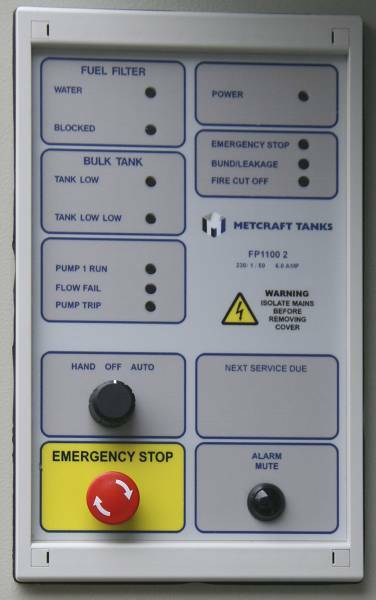 The fuel polisher control panel uses the well proven DSA single Pump Controller. This is a microprocessor-controlled, control panel for use with twin or single pumpsets. The control panel is available in all standard voltages from 12 volt DC to 415/3/50. The panel incorporates tank level controls, bund/seal leakage detection, BMS and fire system interface, using an innovative modular construction. A compact, self-contained microprocessor panel with plug-in connections. Automatic pump changeover for twin pumps with alternate starting sequence. Auto/off/manual facility for each pump. Bulk tank level controls with low/low pump protection, giving local LED and sounder indication and a remote alarm signal. Water in fuel and filter blockage controls with alarms, giving local LED and sounder indication and a remote alarm signal. Switched supply (230/1/50) for Belimo motorised or solenoid valve with facility for low voltage status switch to operate pump contactors. Building Management Interface (BMS) including fire cut off. Standard voltage 240/1/50 (24v AC/DC, 12v DC, 415/3/50 or 110/1/50 available). Mounted in an epoxy-coated steel enclosure 400mm x 500mm x 150mm. Circulates & prevents degradation of fuel inside storage tanks. Passes through a pre-filter fuel conditioner to prevent microbial growth. Fuel is automatically circulated for a preset number of timed periods to ensure tank contents is recirculated 1½ times every 28 days. When the pump flow rate drops below a preset limit (indicating a clogged filter)the flow switch closes & a warning light flashes. Can be linked to our remote warning device (RWD2). External alarm outputs, rated at 230VAC 10A max. 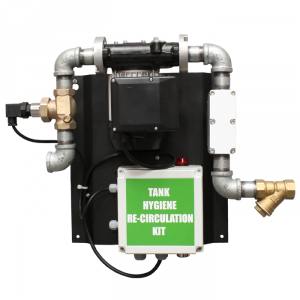 Features a 230V pump unit, inlet strainer, fuel conditioner, flow switch, filter clogged warning light, timer, mains junction box & override key switch. Mounted on a wall/tank mounting plate.